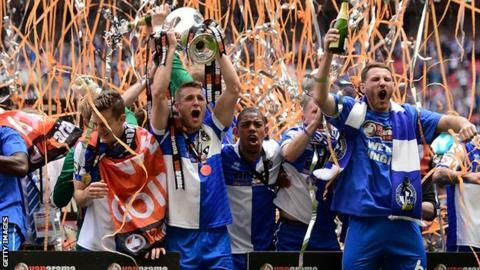 Bristol Rovers beat Grimsby Town on penalties to win the Conference promotion final and secure an instant return to the Football League. The Mariners went ahead inside the opening two minutes at Wembley thanks to Lenell John-Lewis' bundled finish. Bristol Rovers forward Ellis Harrison then slammed home an equaliser. And, after a goalless second half and extra-time period, Lee Mansell scored the winning penalty after Jon-Paul Pittman blazed his spot-kick over. It means Bristol Rovers, relegated from the fourth tier for the first time in 94 years only 12 months ago, are the first side to bounce straight back up from the Conference since 2005. Under 37-year-old manager Darrell Clarke, they had recovered from picking up just one point from their first three matches of this campaign to launch a genuine title challenge, only losing out to champions Barnet on the final day of the season. But they bounced back from that disappointment to register a 3-0 aggregate win over Forest Green in the play-off semi-finals, before again having to display great resilience to overturn an early deficit against the Mariners. By contrast, Grimsby have been a non-league side since their relegation in 2010, and defeat by the Pirates marks their third successive play-off failure. Paul Hurst's team had got off to a flying start in front of a Conference record crowd of 47,029 fans, going ahead after Nathan Arnold's driving run into the penalty area allowed John-Lewis to force the ball over the line at the second attempt. The Mariners continued to press and Rovers goalkeeper Will Puddy survived a major scare when handling Ollie Palmer's shot outside the area, escaping with only a yellow card. But Harrison, recalled after missing the semi-final second leg through suspension, lashed the ball in to restore parity after Grimsby had failed to clear Jake Gosling's corner. The frantic, open nature of the first period could not be matched by a tense and nervy goalless second - a theme that continued throughout extra time. After Rovers boss Clarke had opted to change goalkeepers for the shootout - bringing Steve Mildenhall on to face his former club - the first five penalties were then all successful. But Pittman blasted his effort over the crossbar and, after a further two spot-kicks were converted, Mansell fired into the top corner to send Rovers back up to the Football League at the first time of asking. "Devastated would be a good word. It wasn't our day. No matter what I say here it doesn't change the fact that we've lost the game and lost out on promotion back to the Football League that we all desperately craved. "They are worthy of winning promotion because of how well they've done over the course of the season so congratulations to Bristol Rovers and in particular Darrell (Clarke) who has done a fantastic job. "It's just a shame that we have people driving back to Cleethorpes or a lot of others that are based around the country that we couldn't make it a party night for everyone. "I thanked everyone and told them how proud I am of every single player and not just the ones that have been on the pitch today." Match ends, Bristol Rovers 1(5), Grimsby Town 1(3). Penalty Shootout ends, Bristol Rovers 1(5), Grimsby Town 1(3). Goal! Bristol Rovers 1(5), Grimsby Town 1(3). Lee Mansell (Bristol Rovers) converts the penalty with a right footed shot to the top right corner. Goal! Bristol Rovers 1(4), Grimsby Town 1(3). Craig Clay (Grimsby Town) converts the penalty with a right footed shot to the top left corner. Goal! Bristol Rovers 1(4), Grimsby Town 1(2). Angelo Balanta (Bristol Rovers) converts the penalty with a right footed shot to the bottom left corner. Penalty missed! Bad penalty by Jon-Paul Pittman (Grimsby Town) left footed shot is too high. Jon-Paul Pittman should be disappointed. Goal! Bristol Rovers 1(3), Grimsby Town 1(2). Lee Brown (Bristol Rovers) converts the penalty with a left footed shot to the top left corner. Goal! Bristol Rovers 1(2), Grimsby Town 1(2). Lenell John-Lewis (Grimsby Town) converts the penalty with a right footed shot to the high centre of the goal. Goal! Bristol Rovers 1(2), Grimsby Town 1(1). Matty Taylor (Bristol Rovers) converts the penalty with a right footed shot to the bottom right corner. Goal! Bristol Rovers 1(1), Grimsby Town 1(1). Craig Disley (Grimsby Town) converts the penalty with a right footed shot to the bottom left corner. Goal! Bristol Rovers 1(1), Grimsby Town 1. Chris Lines (Bristol Rovers) converts the penalty with a right footed shot to the bottom right corner. Penalty Shootout begins Bristol Rovers 1, Grimsby Town 1. Second Half Extra Time ends, Bristol Rovers 1, Grimsby Town 1. Substitution, Bristol Rovers. Steve Mildenhall replaces Will Puddy. Corner, Bristol Rovers. Conceded by Carl Magnay. Corner, Grimsby Town. Conceded by Tom Parkes. Offside, Bristol Rovers. Matty Taylor tries a through ball, but Nathan Blissett is caught offside. Foul by Jon-Paul Pittman (Grimsby Town). Mark McChrystal (Bristol Rovers) wins a free kick in the defensive half. Attempt missed. Chris Lines (Bristol Rovers) header from the left side of the six yard box is too high. Assisted by Tom Lockyer with a cross following a set piece situation. Nathan Blissett (Bristol Rovers) wins a free kick on the right wing. Attempt missed. Lenell John-Lewis (Grimsby Town) right footed shot from the right side of the box misses to the left. Assisted by Craig Clay. Second Half Extra Time begins Bristol Rovers 1, Grimsby Town 1. First Half Extra Time ends, Bristol Rovers 1, Grimsby Town 1. Attempt missed. Matty Taylor (Bristol Rovers) left footed shot from outside the box misses to the right. Assisted by Nathan Blissett. Carl Magnay (Grimsby Town) wins a free kick in the defensive half. Foul by Nathan Blissett (Bristol Rovers). Substitution, Grimsby Town. Craig Clay replaces Scott Brown. Attempt saved. Aristote Nsiala (Grimsby Town) header from the left side of the box is saved in the centre of the goal. Assisted by Scott Brown with a cross. Corner, Grimsby Town. Conceded by Andy Monkhouse. Attempt saved. Angelo Balanta (Bristol Rovers) right footed shot from outside the box is saved in the centre of the goal. Assisted by Nathan Blissett with a headed pass. First Half Extra Time begins Bristol Rovers 1, Grimsby Town 1. Second Half ends, Bristol Rovers 1, Grimsby Town 1. Scott Brown (Grimsby Town) wins a free kick in the defensive half. Foul by Lee Mansell (Bristol Rovers). Attempt missed. Lee Mansell (Bristol Rovers) right footed shot from outside the box is too high. Attempt blocked. Angelo Balanta (Bristol Rovers) left footed shot from the centre of the box is blocked. Assisted by Lee Mansell. Scott Brown (Grimsby Town) is shown the yellow card.